I recently learned my grandfather was an alternate for the Canadian Olympic track team. Had I known this when I was a kid, I might have started running much earlier! “What is the meaning of a solar eclipse? To the ancient Chinese, solar eclipses meant that dragons were devouring the sun. To the Czechoslovakians, they meant that ice giants, bitter enemies of the sun, were conquering it. To the Romans, they meant that the sun was poisoned and dying. tl;dr: I’m joining ValiMail as head of communications, because I like email and want it to work right. I’m kind of a fan of email. I’m weird like that: Most of the journalists and tech experts I know say they hate email. But I keep coming back to it. Email is ubiquitous, and since it’s based on open standards, it’s not controlled by any single company. Unlike the rest of the web we lost, it stands, almost alone, as a bastion of universality, accessibility, and openness. You can set up your own email server if you want, with whatever security or lack of security you deem appropriate, and you don’t have to ask anyone’s permission or pay a fee. You can write lengthy formal missives to your friends and business associates or short notes to yourself or your baby daughter. You can use email as your to-do list. You can treat email like SMS and write tight messages without punctuation or capitalization. It’s all good, and it’s all up to you. This is how we did Internet e-mail back in the day, kids. 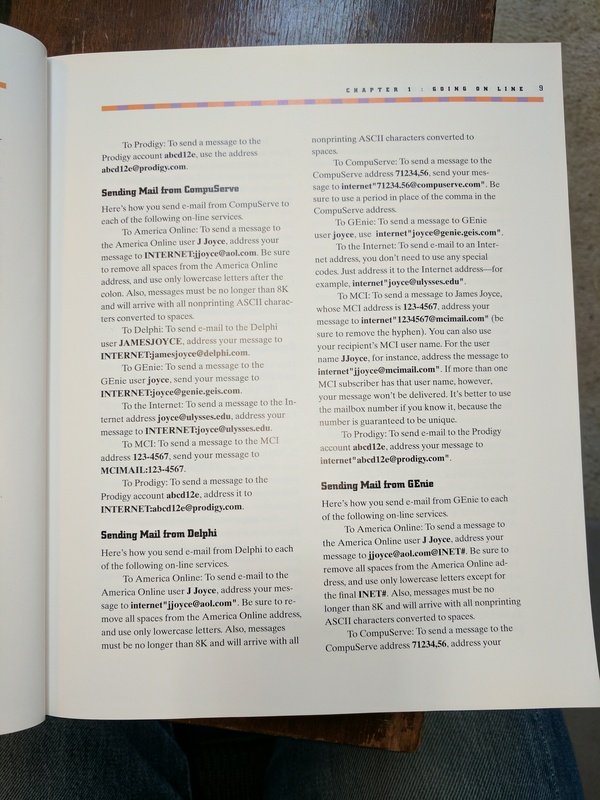 Since then I’ve written about how I’m deluged in mail, passed along secrets for getting me to read your email, made a case for writing shorter emails, and argued that we would all miss email if it died. Email continues to be an essential tool for communication between people and companies. It is the most effective marketing medium bar none. The spam problem is largely taken care of due to sophisticated and adaptable filtering. 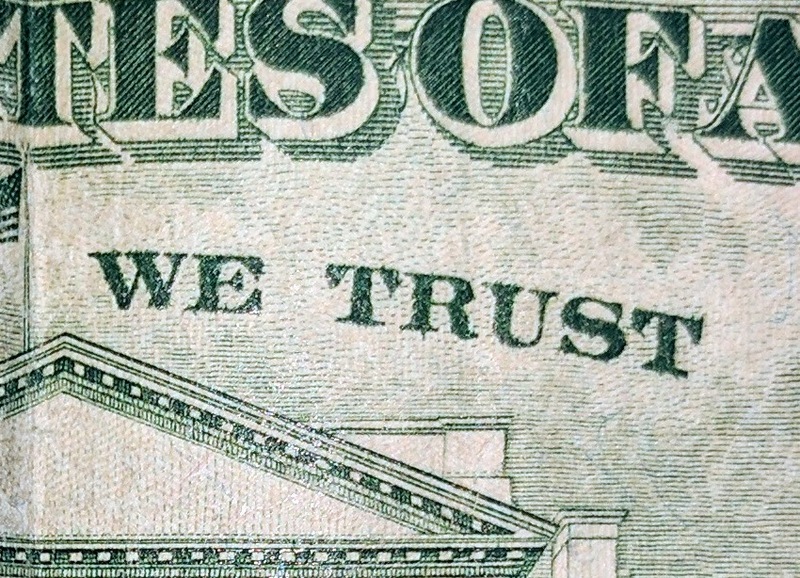 But there’s one big problem remaining, and that’s trustworthiness. In most cases, it’s far too easy impersonate someone in email by putting their name and email address in the From field of your message. There are no built-in safeguards in email’s basic protocols to validate the sender of an email. That’s where email authentication comes in. To simplify a bit, once a domain owner has enabled email authentication and has set an enforcement policy, emails from any authorized senders — to any recipient — will get through. But emails from unauthorized senders won’t even get delivered. It’s complicated to implement, and that’s why most domain owners have not yet enabled authentication, even though the majority of email service providers (like Gmail or Office 365) are compatible with it. And that’s the job that ValiMail handles, by automating the process of setting up, managing, and monitoring email authentication for companies that want to protect their domains. The headline benefit is that it stops phishing. Close behind that is that it protects a company’s brand reputation from bad guys who would impersonate it. A third benefit includes the ability for IT people to get control over “shadow IT” services: cloud services that random employees have signed up for. Whenever those services attempt to send email on behalf of the company, and most of them will, the IT folks get a notification and can make a decision about whether or not to authorize those emails. To make a long story short, ValiMail offered me the position of head of communications, and I accepted. My first day is Monday. If you’re a journalist and want the inside scoop on email authentication, or you could use data on phishing and its broader impact on cybersecurity, let me know. I am going to be a zero-BS comms guy, because I’ve been on the other side and I know what is useful PR and what’s not. I’m going to be useful. If you’re not a journalist and you’re interested in this topic, tune in to the ValiMail blog, where I’ve been writing for over a year and will continue to post what I hope will be interesting and illuminating updates. I didn’t set out to find a job. I was very happily running my own show at Tweney Media, enjoying life as an independent consultant and freelancer. I’m proud that I was able to deliver some great results for my clients. But I like the people at ValiMail, I like what the company is doing, I think there’s a big opportunity there, and most of all, I believe they’ve got something real that will have actual, material benefit to the world. I’m not saying that Snap Spectacles or your social network for dogs don’t have social utility, but with ValiMail, I can clearly see a real benefit that I can get behind. Besides, did I mention that I really like email? And I want it to stay open and free — just more trustworthy. I have loved the San Francisco waterfront since I first saw it. For years, my commutes have taken me along the Peninsula coastline via Caltrain, and then along the Embarcadero on my bike. I’ve got a folder full of photos of the waterfront. I never tire of looking at the Bay Bridge, alongside it, under it, the fireboats next to it, the Claes Oldenberg sculpture of a bow-and-arrow embedded in the grass nearby. When I go to events at Fort Mason I almost always sneak out and walk to the end of a pier so I can look at the water and wonder what the fishermen are catching. I watch people strolling the Embarcadero as I bike along. The water is ever changing, the weather almost as constantly in flux. Weird and wonderful things come and go, like a massive silver rocket ship that stood on the waterfront for several years, or a congregation of cormorants and pelicans clustering on the water for half an hour in pursuit of a tasty school of fish just under the surface. On Sunday I got to see that waterfront from a seal’s point of view. At 9:50am I got in the water at the Golden Gate Bridge, and at about 12:05 I got out at McCovey Cove, about 6.5 miles east and south. I say “I got in the water” and “I got out,” and while it’s true that I did all the swimming by myself, I was also supported by a pilot boat, helmed by Capt. A (who wishes to remain anonymous), encouraged by my wife Karen, and protected by a flotilla of volunteers in Zodiacs and kayaks. Baykeeper organized the swim, and it’s thanks to them and all the volunteers who pitched in that I was even able to attempt this swim. Also, there were about 4 other solo swimmers and a dozen or so relay teams doing the swim at the same time. 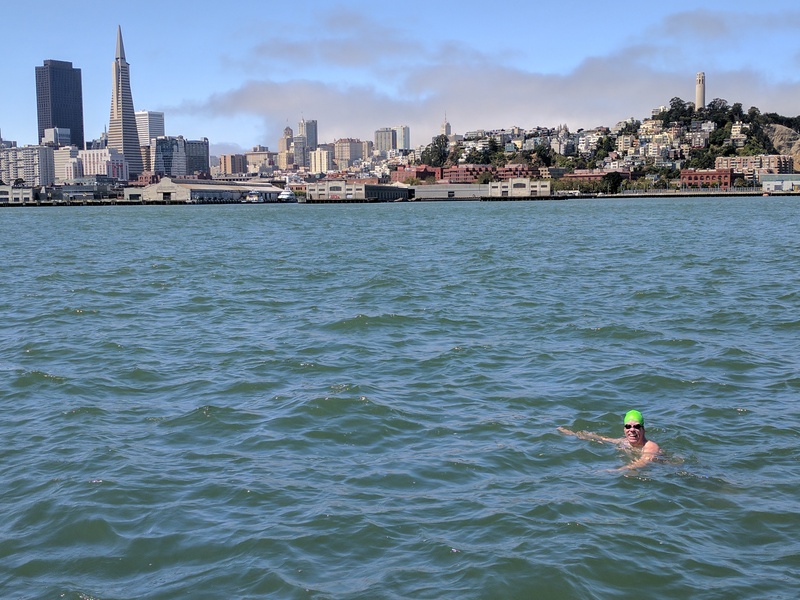 My, or our, swim on Sunday took me along a huge part of San Francisco’s Bay frontage, and it made me realize again how varied and beautiful it is. I tend to be a bit of a tourist when I swim: I’m not that fast to begin with, and I frequently stop to look around when I see an interesting sight, or a bird, or a change in the pattern of waves in the water. It’s because of this that I say my most critical piece of swimming equipment is my goggles. Vision-correcting goggles have been life changers for me: I doubt I would be interested in or comfortable doing open-water swimming if all I could see at a distance were the blurry shapes my naked eyes render to my brain, but with the goggles everything is, apart from drops of water or occasional problems with fogging, crystal clear even at a distance. The fundamental rhythm of being a swimming sightseer is slow, rhythmic, repetitive: A scene glimpsed to the left, then the green of the water below as you breath out; a scene glimpsed to the right, then the green of the water again. These scenes, left and right—assuming you’re a bilateral breather—change slowly. You get important, reassuring information that you’re actually making progress by noticing how the relative positions of distant and more-distant objects change in parallax. The view in front of you, as you lift your head to sight forward, tends to change even more slowly, and you glimpse it even less often, making it a more fragmentary, tactical series of views. But the views to the side stitch themselves into a long panorama, the long scroll of the shoreline unfurling in slow motion alongside you. Dylan in the water with a whale in the background. Just before the swim began we spotted humpback whales to our north, breaching near the north tower of the Golden Gate Bridge. I was excited about this because I feel a special bond with humpbacks: I enjoy their playful and peaceful personalities and I see them as a triumph of the environmental movement. Once near extinction, the “save the whales” movement, though easy to mock, was incredibly successful and has protected the humpbacks long enough that their populations, in most parts of the world where they are found, have rebounded remarkably. These whales continued their display as I started my swim, and though I didn’t see them from the water Karen captured one photo where you can see a whale in the background and me in the foreground. For the first hour or so my concern was to make a good start and cover some distance, so I swam hard. Fort Point, the Presidio, and Chrissy Field to my right, with their furry, green hills, slowly gave way to the area around the Palace of Fine Arts, its golden dome shining brightly under the overcast sky. That dome was my companion for a long time, it seemed, as the Marin headlands to my left fell away and I aimed for Alcatraz in front of me. At some point Capt. A moved the boat from my right rear quarter over to my left side. Its large bulk obscured the view to the left for a long time, but in return I got to see the encouraging sight of Karen and Capt. A watching me, cheering me on, and taking photos. And then, a bit less than an hour along, we were abreast of Fort Mason’s bright cream-colored buildings and then Aquatic Park, less visible than I’d thought it would be from the distance we were, but with the Ghirardelli sign showing clearly out above it. Capt. A threw my Odwalla bottle to me, tied to a long string, and as I took a few sips I noticed Alcatraz peeking out on the other side of the boat, alongside me and enormous instead of ahead of me and smallish. At that point I knew I’d made good progress and I started enjoying the swim more. For the next hour we went along the waterfront I know well: the Jeremiah O’Brien’s battleship-grey bulk, Fisherman’s Wharf and Pier 39, the Embarcadero’s many piers leading up to the broad low profile of the Ferry Building with its clock tower standing up in the middle. Behind the clock tower were the rising hills of skyscrapers downtown, bracketed by the old 1970s Transamerica Pyramid on the right, and the new, rounded, not-yet-complete blunt pickle shape of the Salesforce Tower on the left. Dylan in the water with the Transamerica Pyramid and Coit Tower. Eventually we were alongside Cupid’s Span, clearly visible in front of the brick buildings of the old working waterfront, former warehouses exemplified by the Hills Bros. coffee building, its long-obsolete sign still standing as a reminder of the city’s long-gone working-class past. The sun was coming out and the quality of the light and the water changed dramatically as I approached the Bay Bridge. Instead of cold grey-green water I was now swimming in a warm bright yellowish-green, and the sunlight glinted on the surface of the waves and cast shadows underneath the Bay Bridge. I swam directly under the bridge, paused to whoop and holler and float on my back for a moment, gazing up at its underside: I knew I had come a long way, in less than two hours, and the hardest part was done. And there I was, looking up at the bridge I had spent years admiring and looking up at, only this time I was in the water and I had swum to it, all the way from that other bridge, the Golden Gate, which I’d been looking up at just a couple hours before. 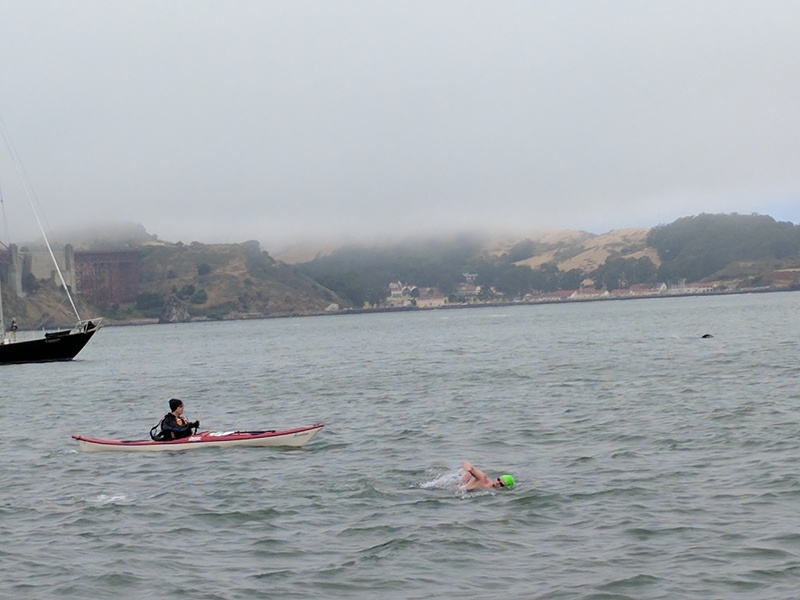 After passing the Bay Bridge the water was getting noticeably warmer, but also it seemed I wasn’t making nearly as much progress—the current had slackened a bit. Also, perhaps, in my mind I was assuming I was close to the end, but I had underestimated the remaining distance. As I swam along the grey warehouses and parking piers of the SoMa waterfront I kept wondering: How much further to AT&T Park? Why aren’t I there yet? Where is it? After twenty minutes or so, though, the long, low breakwater that shelters the marina adjacent to the ballpark came into view. It was about this time that I encountered the Bay Parade proper, a fleet of colorful kayakers and paddle boarders coming the other way. I swam through a group of them, and they shouted encouragement to me as they went by in the opposite direction. I asked Capt. A where I was supposed to be swimming, and he pointed out two red buoys on the water. I could barely see them but there was a speck of red, so I aimed for that. It took a frustratingly long time, it seemed, in water that was growing warmer and more resistant to progress, before the red speck resolved and became clearly visible as a pyramidal buoy. In fact the current was still pushing me along a little bit, I’m sure, only less than before. I was so used to the feeling of rocketing along on a major flood by that time that having to provide most of my own forward momentum felt like resistance—like normal swimming. At any rate, I eventually came within shouting distance of the buoy on the right, and I swam hard until I was sure that I had cleared the imaginary line between it and the buoy on the left. I was done! As Capt A’s boat pulled up alongside me, I could see Karen on the deck shouting and me and taking pictures. I whooped, raised both fists in the air, and my head immediately submerged under water. I tried again, kicking a bit harder this time: The victory pose is a little tricky in the water. That’s a magical narwhal in the water next to the Baykeeper boat. 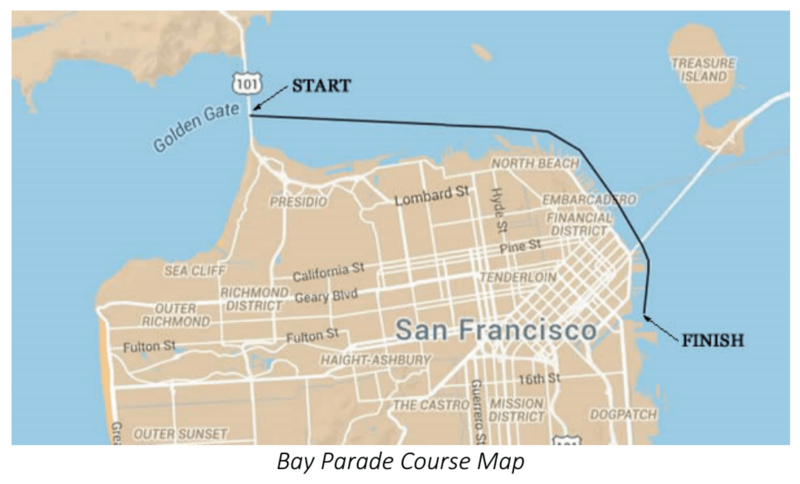 I climbed aboard the boat and stood soaking up the sun and the accomplishment for half an hour, and then the Bay Parade returned and it was time for the finale alongside AT&T Park. I put on my unicorn-horn swim cap and jumped back into the water, this time as a magical narwhal, for an easy swim back and forth with a group of other swimmers. We were all happy, paddling slowly, a little confused from the effects of cold water, but enjoying the moment. Aboard the Baykeeper sailboat Freda the band SeaForager’s Fishwives was playing a squeezebox and singing sea chanties; I joined in for a few lines of “Blow the Man Down.” And then we swam into the harbor and exited the water. Someone was taking video of the parade and showed it on the Jumbotron inside the ballpark, where the Giants vs. Marlins game was just about to start. 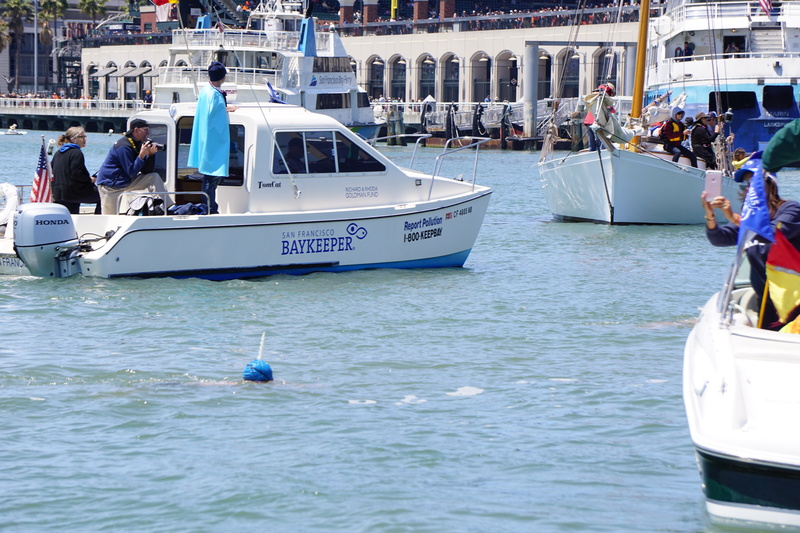 As for me, I was enjoying a warm shower in a portable shower truck provided by Baykeeper, and then I went and celebrated with the other swimmers and parade participants in a party on the other side of McCovey Cove. I was not the fastest swimmer, by far. The winning swimmer completed the swim in 1:35, while it took me 2:15 or 2:20. But I don’t care. Five years ago I could barely swim 100 yards without having to stop and catch my breath. Sunday I covered the distance almost nonstop, with a lot of help and encouragement and support from Capt. A and Karen, and from the many supporting pilots and kayakers on the water from the Dolphin Club and the South End Rowing Club. I got to see the waterfront I love so much, from a reverse angle, and I gained a new appreciation for its variety and the way it all fits together. And, I am happy to say, my supporters completely blew me away. You guys collectively donated almost $2,400 to Baykeeper, helping to fund the organization’s important mission of researching and defending the health of the Bay. I know Baykeeper is grateful. And I am so appreciative. I felt your support the entire length of the swim. Water textures in the SF Bay. The Delta and the Bay.